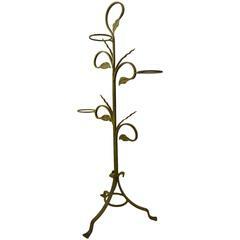 Gorgeous pair of French wrought iron jardinières or plant stands featuring a rich patinated metal finish. 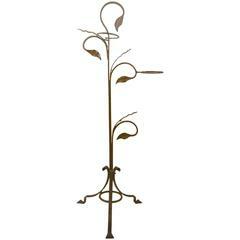 Covered with beautiful wrought iron roses and vines over a scrolled base with hairpin legs. Each scrolled leg has a hanging ring decorated with a rose. Large 14 inch opening on top of planters. Vintage paint with a patinated metal finish. 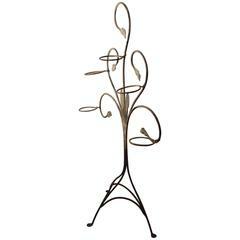 Wrought iron freestanding plant stand by Salterini. This example hold two flower pots, and is in old tan paint finish, paint shows wear, normal and consistent with age. 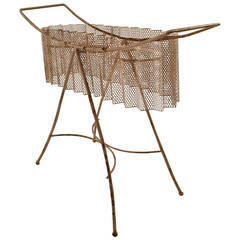 Wrought iron freestanding plant stand by Salterini. 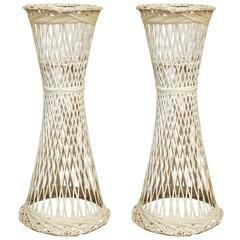 This example hold five pots, standing on tri part base, suitable for indoor or outdoor use. This freestanding iron plant stand was hand wrought from one single iron pc. 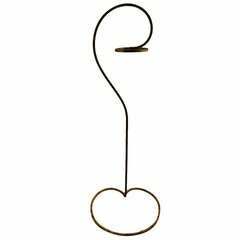 Curvy organic design, holds one small potted plant. Freestanding Salterini plant stand, in old green paint finish. This example hold three pots, as shown. Suitable for indoor or outdoor use. 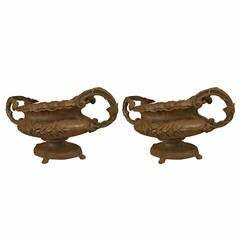 Pair of 19th century French oval shaped iron planters with scroll design sides and a floral relief design and scalloped top.